What an incredibly sweet couple these two are! Eli and Rebekah will be getting married next May at the incredibly gorgeous venue Alturia Farm. We shot there over a year ago and we have been itching to go back. These two are going to have an incredible day at the farm and after their engagement session, their wedding will not come fast enough for us! We met this gorgeous couple and their sweet boy Charlie at the Richmond Capitol building. They were ready to go and we got right to work! I love how Charlie just smiled along and posed with his humans. We worked through the photos quickly with Charlie so that he could go back home with Rebekah’s parents. We love that they brought him along and I am so glad we were able to get some with their fur baby! The Virginia State Capitol has such stunning architecture. I love when we get the chance to shoot at the Capitol building because it is a photographers dream with all the white pillars, steps, and gorgeous flowers that line the walkways. This Richmond engagement session had it all! Eli and Rebekah have such great chemistry and made us feel so at ease while shooting. By the end of the session we just felt like we were hanging out with friends! After the Capitol building, we headed Belle Isle Park. We were hoping to venture out onto the water. When the water is low you can stand on the rocks and it is so fun and pretty. Unfortunately, the water levels were high that day. While crossing the bridge, we realized that there was no way we would be venturing onto the rocks in the river. We didn’t let that put a damper on things. The belle isle nature park is so unique and we took full advantage of the bridge and tall grass! 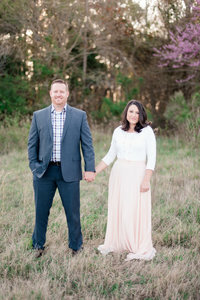 Engagement Photography sessions allow us to get to know our couples before the big day. We want our couples to feel confident in us and we have realized that when we do an engagement session, a lot of the butterflies of being in front of the camera diminish. They get to know us and by the time the wedding comes around, they feel more relaxed with us. We always recommend an engagement session, and with couples like Rebekah and Eli, our job is always super easy! Sharing below some of our favorites from the day! We didn’t even need to try hard to get this! They are the sweetest! Look at that ring! Loving this style! We ended when it was almost dark! We were undeniably pushing our cameras but it was oh so worth it! To see some amazing wedding photography view below! If you are a bride planning a Richmond or nearby wedding we would LOVE to chat! Feel free to reach out to us and share your story!